A history of opera pumps/court shoes | Keikari.com A history of opera pumps/court shoes | On classic men's style, elegance and the beautiful life. Opera pumps (or court shoes) are the plainest formalwear shoes for men. Their archetype dates back to at least the 1730s when the European noble and gentlemen wore delicate, low, often silken, and laceless footwear in court and society gatherings. A particular vogue were leather soles or heels dyed red. As contemporary pumps have changed little from their forefathers, they are men’s oldest classic shoe type still in use. In the England of Regency days, gentlemen wore graceful, tasseled Hessian riding boots in daylight, and patent leather pumps with knee-breeches during evening occasions and opera performances. Before Beau Brummell’s time, the pumps had decorative and expensive silver buckles that were replaced with silky bows due to his influence at the beginning of the 1800s. The change was seen more fitting for the times, likely due to the violent rumpus in France just a decade before. True to its name, the pump has no laces. It is constructed with soles as thin as possible to make the foot look smaller and formal. The sole unit is usually glued on and made from leather so that dancing is easier with a well-gliding material, and feet will not sweat as much. The shoe rarely has a welt. The upper leather in opera pumps is lasted with the wholecut method so it only has one seam behind the heel, and this seamlessness makes the shoe type seem ever daintier and cleaner. The fit cannot be adjusted with laces so the shape of the last is key for keeping the shoe on, and avoiding heel slip. The natural colour for pumps has been black, but coloured velvet models have been made for house slippers or rare Casual Black Tie affairs. The only decoration for pumps is the pre-tied bow on the instep, usually made from grosgrain, silk, or velvet. The topline may also have piping made from these materials. The traditional toe shape is round. Pumps are usually made very low and open, in keeping with the historical shape, to better display the foot and the gleaming silken formal socks usually worn with black or white tie. Some pairs also have a decorative quilted lining, while most are leather-lined. The heel is usually lower than the average 3 cm height of benchmade pairs. Patent leather, or very well-polished calfskin, opera pumps remained the formalwear shoe of choice for gentlemen into the 1930s, when laced models began their world conquest. Later on, the pump has diminished, albeit with some exceptions. The style icon Frank Sinatra, for one, was a friend of the pump and gently dubbed his pair Mary Jane. Opera pump shunning is likely due to its feminine look and the overall decrease of formal events. These pumps are only seen on the feet of the braver dressers in black or white tie occasions. Whatever the reader’s view on the style, pumps are the most laborious form in occasional dressing because they are not made by too many factories, the fit must be exact, and the shoe cannot be appropriated to everyday wear. The opera pump is simply too formal for this. If one does find a good pair, this partywear can only be worn with a dinner jacket or white tie and tails. A smoking jacket set is debatable. 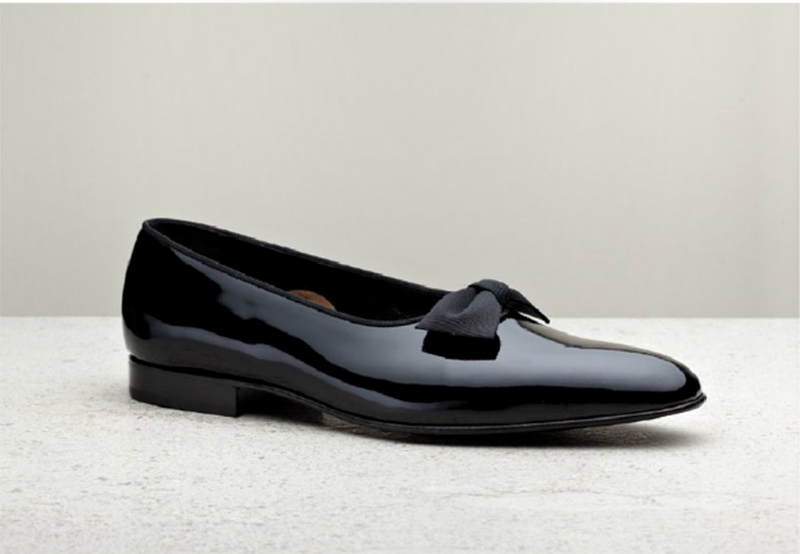 An added nuisance is patent leather as it forms deep, permanent creases quickly, and makes the shoes look crinkly. This problem can be easily avoided by finding a calfskin pair, and managing to shine a parade look on them. In addition, the pump is so light and open that it will make a poor walking shoe or protection for the feet. In celebrations, though, it will outshine all others because a finer shoe has not been invented yet. Translated from my new book, Klassikko: Jokaisen miehen tyylikirja (The Classic: Each Man’s Style Book). Opera pumps are great! I have five or six pair and wear them once or twice a week with khakis and a polo shirt. It takes some balls to pull off and I manage. The shoes I have (e.g. Polo, Cole Haan Bragano) are pretty sturdy and hold up to street usage.